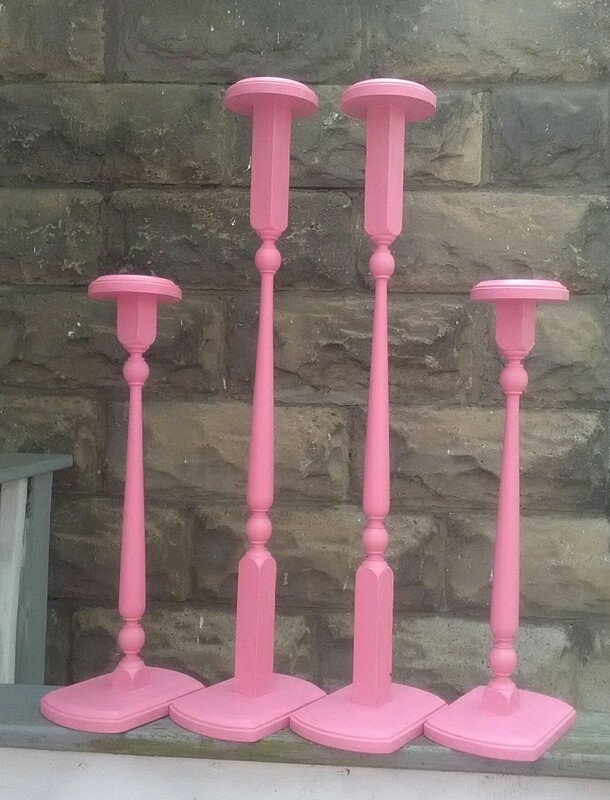 I was quite happy with the assortment of bonnet and hat stands I had last year, particularly the blue ones that match the paint I love in Hosmer’s Inn. I wasn’t going to make any more. Well, then I stumbled upon a set of spindles at a yard sale for $10 screaming to be made into stands. I had Dan cut them down to two heights, removing the damaged topes and bottoms. (We need some saws at home.) I added those pine wood plaques from JoAnn’s to the tops and bottoms. I put wood putty over the screws, top and bottom. After much indecision, rose or green or red or yellow or rose or green….. I settled on a peach milk paint on clearance at JoAnn’s. Fail. This paint was far, far to watery for the hardwood spindles. It was okay for the soft pine bases. The spindles just looked awful. The rose turned out much more pink in the sun than I planned. Pretty, but bright. I wanted lively and colorful. But, I am hoping they won’t look so bright inside. The building has windows with shades, keeping it subdued and comfortable. I like them. They may not see so bright once you put hats or bonnets on them. You can glaze them, cream or white or even some shade of tan or brown. Maybe even a crackle glaze for an aged look? Or add white or grey to the purchased paint and add another coat. I’ve mixed the bottled craft paint with wall latex and it worked for me. I need to fix oopses a lot, so have practice 😉!